To begin this article, I began to list the "cautions" that go along with the term "survival" , but as I looked back at the first draft, it sounded like I was trying to convince the traveler to "Never go to Mexico!" But that's not at all what I wanted to do. 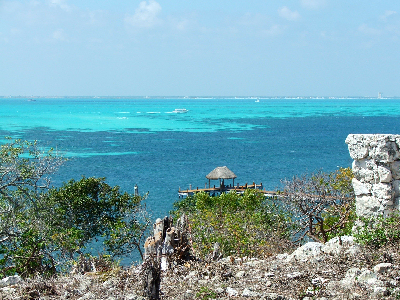 A most obvious reason for going to the Mexican Riviera (the east side of the Yucatan Peninsula) is to enjoy the sun and the beaches. But next on the list, unless you are a spring-breaker, is to visit a culture different from your own while enjoying a vacation-land experience. And there is plenty of both. So, the reason for this article, then, is to help you to enjoy all the benefits of your visit by minimizing your chances of a mishap. So, in my list of tips, I will try to state a situation and then give some solutions or work-arounds. We think that a significant part of the fun of being there is figuring out a way to deal with these situations. 1.-I have rewritten this tip about 100 times so far, and I'm not sure I'm done yet. We have met an uncountable number of wonderful local people on our many trips to Mexico over the last 15+ years. When they get to know you, you'd be proud to have any of them as close neighbors. But, when you are simply the "tourist to be exploited so that we can make a living", it may be a different story. THE TIP---Get the whole story. Maybe a better way to put it is that they never tell the casual tourist the whole story. I don't think most of the people we deal with set out to Knowingly LIE. But I do think it must be a cultural thing. The important thing here is that whatever anyone down there tells you, you always have to ask yourself: -"What is wrong with this picture? "- As soon as you let your guard down, you will get stung! Use these situations to get to know the people better. If you speak pleasantly to them, you can often learn valuable tips for future use. 2.-Airport Money Exchanges: Don't use the airport money exchanges when you arrive. They have some of the poorest rates in the area. When I say "poorest rates" I am talking about a difference of 10 or 15 percent, so the world hasn't come to an end if you do do it..
Update, March, 2011: I have started noticing ATM's at the airport. I used one this year for the first time and the exchange rate was as good as at any other ATM I used during our trip. If you need money for cabs, etc. until you can get to an ATM, use US Dollars (USD). Almost everyone will accept them. 3.-You may want to use the airport money exchanges when you leave Mexico if you find yourself with an excess of local currency. You won't get a very good rate, but at least you won't be stuck with pesos that you can't spend when you get home. 4.-Use your ATM card for local currency to get the best exchange rates. Here in Cozumel, as I believe elsewhere in the Riviera Maya there is a growing problem with ATM skimmers and they are very good at it. There even are remote tools they can use that can get personal info from people using ATMs whether at airport, stores, or street machines. It is widely known here to use only bank ATMs as they require a secure line to bank. 5.-Retailers hardly ever have much change. They are constantly after you for smaller bills or coins. I have been told that they do this because they don't want to be stuck with too much currency around since the exchange rate can vary a lot from day to day. Anyway, you need to keep trying to get smaller bills and pocket change whenever you can. This is made harder to do by most ATMs since they often give you fairly large bills. For instance: if I get 2000 pesos, the ATM may give me 3 X 500, 2 X 200 and 1 X 100 peso notes. Since nobody wants to take a 500 peso note to pay for a purchase under about 300 pesos, I quickly find myself with only the 500 peso notes in my wallet. 6.-Don't take a lot of US Currency with you. This is not a hard and fast rule, though, because in many areas on the Yucatan, for instance, they happily accept Dollars (USD). But you may not be able to tell if you got a decent exchange rate. 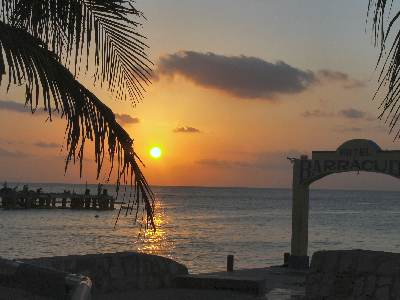 7.-You can find a room on the Cancun Strip (Zona Hoteles), in Playa Del Carmen and on Cozumel even in February for about $50 per night (2003) or less if you shop around. At this price, don't expect it to be a "Kleenex" type of room. 8.-Bugs: Interestingly, there are relatively few flies and mosquitoes around. But there certainly are other kinds of bugs. Need I mention the "big C"? And little ants. They seem to invade even the best places. Should one bring a couple of "Ant or Roach Hotels"? It's up to you. If you dont want to see the "big C", then don't race into your dark room, turn on the lights and look immediately into the corners. Give them a chance to run for cover. 9.-When at the airport, if you engage a van to take you someplace, be prepared to wait around while they find enough people to stuff the vehicle. No matter what they SAY, they want to fill that van as full as they can. I think the worst deal is when you pay for a Van or Cab in advance as part of your hotel. Then they know they've got you and you may have to wait for hours! 10.-I heard that the average wage for Mexican unskilled workers is $1.57 per hour (2004). A tip of 2 or 3 dollars per day to a maid can go a long way toward making your stay more pleasant and her day more profitable. 11.-The older hotels on the south end of the Cancun strip can often be had as real bargains, but they do suffer from age. You have to be ready to put up with a noisy air conditioner or a balky toilet. On the other hand, these older properties may have the best beaches on the strip. In general, as you go north up the strip from the Westin Regina, the beaches are pretty good up to the Hilton, but then start to get skinnier. This changed after Hurricane Wilma in 2008. Those north end beaches disappeared, but they have been replaced and are currently (2010) better than they have been for years. If there's a point to this tip, it's that the beaches change with the year. One hurricane can make a good deal into a bad deal, if the beach is important to you. It's wise to check! 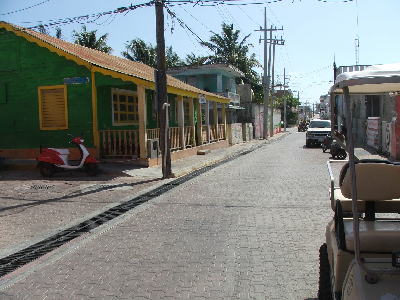 12.-Use the local bus for transportation up and down the strip and to get to downtown Cancun. It currently costs 7.5 pesos (2010). These buses used to run about every 30 seconds, but since the financial crisis in 2009, the swine flu situation and the kidnappings got started you may have to wait several minutes at certain times of the day. There are many different routes, but almost any one of them will get you from the south end of the strip to the north end. If you find yourself downtown, you need a bus labeled "Zona Hoteles" to get back to the strip. 13.-Get a map and find the Centro Bus depot if you want an easy, inexpensive way to get to other coastal towns. At this depot, you will find buses like our Greyhound Bus system. In Mexico they have first class and second class bus service. I highly recommend the first class buses because they are clean, modern and air conditioned. 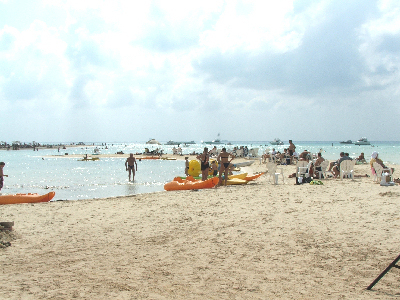 It costs about 48 pesos (2013)to go from the Cancun Centro bus station to Playa Del Carmen. These buses leave from either end of the line at about 10 to 20 minute intervals. 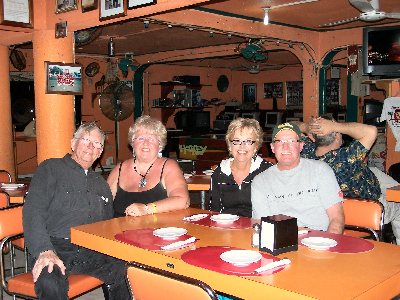 14.-You can find great places to eat local food inexpensively downtown Cancun. Look for places where the local people are eating. We can get dinner for 4 with a mixed drink or beer apiece for under $30 (2003). 15.-Don't pack things that you can buy when you arrive. One of the local bus routes in Cancun is marked "Walmart". Go there as soon as you are settled and get what you need. 16.-Water isn't always potable. If in doubt, there is a lot of bottled water sold down there, Plan to get some. It's a good idea to have plenty of water anyway, to avoid dehydration when it's hot. We usually brush our teeth with local water, even if potablility is in doubt. We have never gotten sick from anything we ate or drank there. 17.-For the last few years, Americans ("norte Americanos") have been able to buy land and real estate in certain parts of Mexico. You can find many of them running businesses down there. Restaurants are one example. Seek them out and ask some of the questions that will be on your mind. It's a good way to get a feel for how things really work. 18.-You can get good deals on rental cars, tours etc. by accepting offers to sit through "time share presentations". But they will take up to half a day to go through and you will have to learn to say "no, no, no." You do, usually get a free breakfast. You might as well try one of them early on. Then you will find it easier to say "NO!" whenever someone offers you a GREAT, too-good-to-be-true deal. The salespeople usually work on straight commission, so don't be surprised if they become surly if you take up their time and then say "no". I personally think that is appropriate to sit through a presentation or two, but realize that the people you dealing with have to make a living. 19.-Wash cloths are not necessarily part of the bathroom linens. The upscale places have usually have them, but even then, the concept of refilling your linens completely every day hasn't gotten down to the trenches in all places yet. I would play it safe and bring at least one or two washcloths with me. This "No washcloth" thing isn't limited to Mexico. In many European countries, washcloths aren't supplied either, at least in many 3 and 4 star hotels. 20.-Walking can be dangerous!!!! Traffic is traffic; I don't think you'll find the Mexican drivers any worse than drivers in our own big cities. However, the tourists bear constant attention!!!! Especially where motor scooters and golf carts are being rented. They don't seem to notice the one way streets and they always seem to be in hurry to get back to the bus. So, watch it when crossing the street! 21.-Toilets: Unless you go to fancy places, you will probably find the toilets (Banos') well below US standards. They often have no seat on the toilet and there may be no toilet paper available. Water always seems to be in short supply, so flushing the toilet or urinal may take a little creativity. The Mexican concept of sewage disposal is a lot different from ours. It is not at all uncommon to smell sewerage odors here and there. Some of the floor drains don't have P traps. And if there are P traps, sometimes they go dry. So, if you think an odor is coming from a floor drain, pour a couple of cups of water down it so it will "seal". Sometimes the Banos' won't have any paper for wiping your hands after you wash up. I have noticed that many Mexicans (males mostly) wipe their just-cleaned hands by running their fingers through their hair. Plan to pay from 2 to 5 pesos to use the rest rooms in many public places. I think this is a worthwhile investment in order to get reasonably clean accommodations. 22.-Walking on the sidewalk can be the most dangerous place of all!!!! 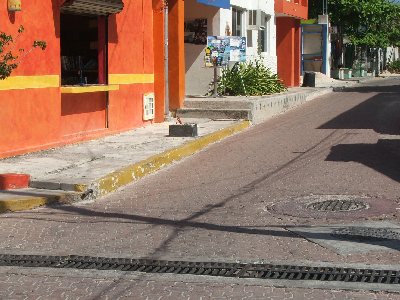 Mexican street planners and contractors don't have ANY idea of personal safety when it come to sidewalks. If you write down 10 things that can be wrong about a sidewalk, I'll bet I can add 10 more from personal experience in Mexico. 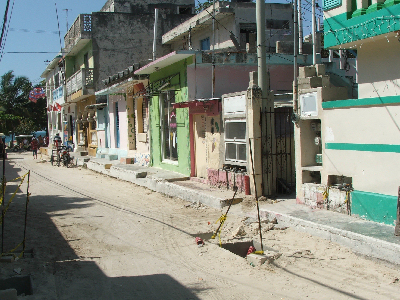 The sidewalks are seldom level, usually narrow and can totally disappear at any moment. The condition of the pavement can change drastically at any time. Sometimes there will be holes to fall into. 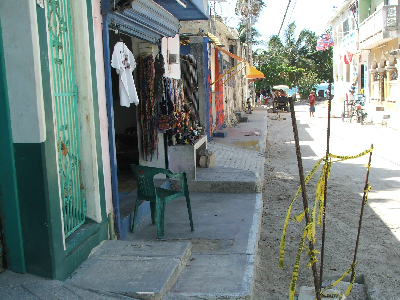 Sometimes driveways or other inclines will be built into the sidewalk in strange places. Often, you will find these inclines leading nowhere, since a wall now stands where a driveway once was. Dips and swoops are common. Pipes and guy-bolts stick out at crazy angles. 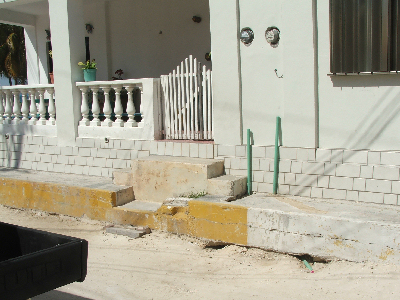 The height of the curb varies from nothing to a foot high and back again. The idea of painting some sort of diagonal stripe to give you a hint is totally foreign to them. Double Trouble Several Level Changes and Pile of Sand- NOT Uncommon! This walking problem isn't limited to the city streets. Even in buildings, it's a problem. There seem to be no standards for stair risers. We in the US almost Always build stairs with about a 7 1/2 inch rise. In Mexico, they go all over the map, even varying significantly on a single flight of stairs. One of the worst things is that the floors change levels with no notice. Maybe just an inch or two, but enough to trip you up if you aren't looking carefully where your feet are! Street lighting is often poor, so take all of this into account even more strongly when you are out at night. Guard rails are not used in any uniform way. If you fall off of a balcony because there's no guard rail, tough luck to you. It is really easy to simply step off a patio or some such since there's usually no warning at all. 23.-Wheelchair access: Don't make me laugh. It's almost funny (if it wasn't so serious) to see some of the attempts at putting ramps at street corners. You can often see that they made the ramp too narrow and then came along later and just hacked away at the concrete to widen it. Then, to make matters worse, if the handicapped person did manage to get up the 30 degree incline, they could go about 30 feet before the sidewalk, barely wide enough for the wheelchair anyway, gets split into 2 10 inch wide pieces by a power pole. Of course at that point, the sidewalk is about a foot above the road surface, with no way to get to it. 24.-Bathroom Sinks: They usually have no stoppers, so washing out some clothes or using the sink for a sponge bath is out of the question. Consider bringing one of those 4 or 5 inch diameter flat rubber drain covers with you. 25.-Duct Tape: Bring a small roll. 26.-BandAids: Bring a few of your favorite brand. Bring some Liquid Bandage. 27.-Clothesline: A 20 foot length wouldn't hurt. 29.-If you plan to spend a lot of time on the beach, buy a collapsible cooler on that trip to Walmart. 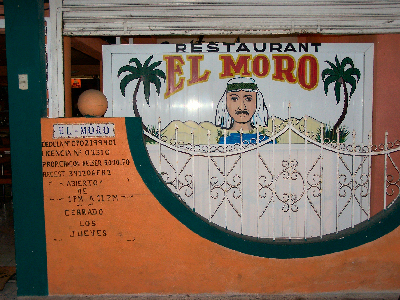 30.-If you get to Cozumel, you HAVE TO try the "Flattened Shrimp" at El Moro. It's a 10 minute cab ride from the ferry dock, but well worth it! I really mean it. These tips are not meant to discourage you from coming, rather to make sure you are prepared so you can really enjoy yourselves. After all, if you didn't want to see something new and different, you could have stayed home, right? Finally, if you have any tips to add, or if you think I have been inaccurate in any way, please use the "Contact" link on the Navigation bar at the top of the page to let us know.